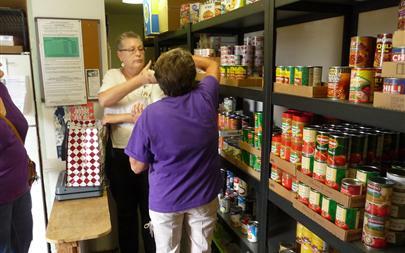 Kelly and Donna work side by side to provide food for clients. 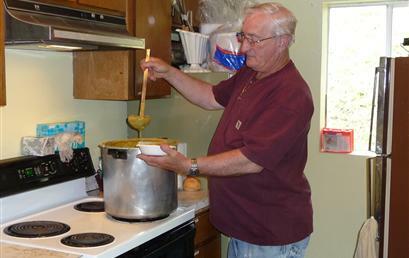 Ron is serving up soup to the clients. Every Wednesday. Ron prepares delicious homemade soup and bread. We welcome our clients in for a hearty meal, fellowship and food boxes. 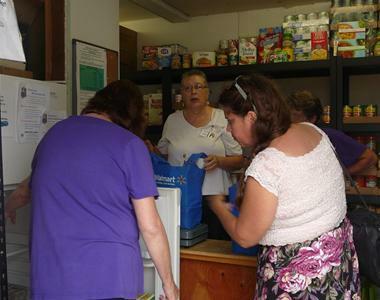 Like most food banks around the State, our available products vary from week to week... Our inventory depends on donations from local individuals and businesses, The Oregon Food Bank, and the volume of families using the service. We try to see that our shelves are stocked with nutritious foods to supplement your dietary needs. Staple foods such as rice, beans and peanut butter are always available. We would love to offer you recipes on ways to fix these staple foods. Just ask one of the volunteers. 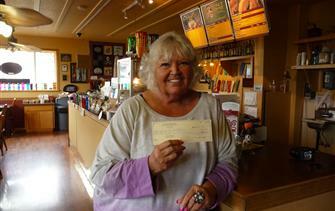 Pantry Manager, Donna Sanders, accepts a donation from the annual event has helped to support the food pantry for over four years, Thank You to all the "Pirates" and event coordinators.